Newly appointed Secretary of State John Kerry has a long and distinguished history of working at the intersection of national security and climate change. As such, the overlap in these areas of expertise will likely be a particularly important part of his tenure. (For a good overview of why Kerry should address the security risks of climate change see this recent article by Coral Davenport). Geographically speaking, one state of particular interest to the Secretary should be Pakistan – a place where U.S. national security interests and climate change clash. During the first term of the Obama administration, Senator Kerry was sometimes referred to as the “Pakistan Whisperer,” given his knack for helping to ease tensions between the U.S. and its difficult ally. Senator Kerry often worked closely with the late Ambassador Richard Holbrooke, who was the Administration’s special envoy for Afghanistan and Pakistan, and would at times help to convey Holbrooke’s message to both U.S. and Pakistani officials. It has been noted that Senator Kerry and Amb. Holbrooke were “kindred spirits,” and given their convergent interests, it may not be unreasonable to suspect that Holbrooke may have conveyed his concerns about the clear and present climate risks within Pakistan to his colleague in the Senate. Pakistan, in addition to playing a critical role in U.S. foreign policy, and playing host to a mélange of international security risks including the proliferation of nuclear materials and Islamist terrorism, tops the Global Climate Risk Index as one of the most vulnerable nation to a multitude of climatic risks. Pakistan understands these risks and is starting to take action to mitigate them, but it is unclear if such measures will be sufficient. Major flooding in 2010 inundated a fifth of the country and impacted over 18 million people, while powerful monsoons have continued to flood the country in years since. While Pakistan is necessarily keen on maintaining national and regional stability, and preventing humanitarian disasters like these from occurring in the future, support from the U.S. will be essential for helping to reduce these risks. Some are hoping that Secretary Kerry will go on to achieve the late Amb. Holbrooke’s ambition of brokering a peace agreement in the region. In that context, Secretary Kerry would certainly be wise to heed the warnings of Amb. Holbrooke by incorporating climate change risk mitigation into his strategy for engaging Pakistan (and, for that matter, India, which shares a climate-stressed water supply with its neighbor). Historically speaking, water stresses have often led to cooperative agreements among affected states. Helping to tackle the water security implications of climate change might offer a good foundation for a broader agreement between Pakistan and India, or at the very least, a point of constructive engagement that could help build both trust and resilience. 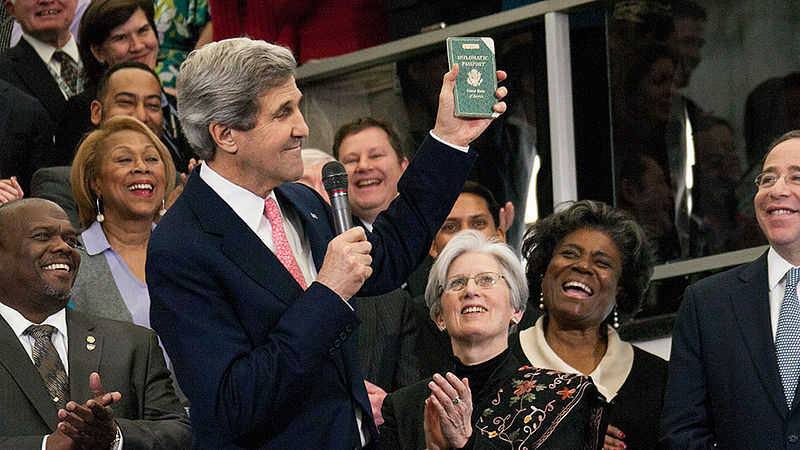 To be sure, Secretary Kerry will face significant and myriad challenges as the nation’s top diplomat. But his record shows that he has the capacity to grasp the complex intersection of international security and climate change, just as his close colleague Amb Holbrooke did. Robustly addressing this critical nexus, in Pakistan and elsewhere, would not be a bad legacy to strive for. By Caitlin Werrell and Francesco Femia in climate-security on February 6, 2013 .